Q1 Design, a technology company specialising in digital platforms and applications for the property development industry. Cuan has 7 years experience in the digital collaboration industry. He is a qualified mechanical engineer and studied at QUT in Brisbane, specialising in acoustics and building design acoustics. Q1 Design is a technology company that specialises in digital collaboration. We bring people together with digital content, whether it is colleagues who need to share content or businesses who need to inform and sell. How did Q1 Design start? Q1 was started during the mobile revolution. We quickly noticed the benefit of personal mobile devices but also noticed they were separating individuals from working together. Everyone has their own device of some sort which makes it difficult for people to collaborate together. We create solutions that include large collaborative platforms and apps designed to get people working together on digital devices. Where can this technology be installed? Our collaborative platforms are best installed into tables and benchtops that help create a collaborative environment. They are installed in minutes by simply ‘dropping-in’ to a recess. Our systems startup themselves in the morning, run maintenance and then shutdown at night. We have remote access to all our systems allowing our team to remotely update and support at any time. We also provide portable solutions in the form of small and large tablets to take property projects to the door step of clients around the world. How does this technology benefit project marketers? Our property project marketing solutions include two platforms. Our sales centre digital tools assist in the sales process and our mobile apps help to improve client communications. Our sales centre digital tools help foster personal relationships between the sales team and the client. The sales team can jump straight into any floor of the building, then into any apartment and compare floorplans/view/depreciation schedules etc. Our systems makes the selection and sales experience intuitive and seamless for the sales team and client. The sales team have all the latest marketing collateral at their fingertips making for a confident presentation to the client. Our mobile apps put the development in the pocket of prospective clients locally and internationally. The client can view all the information on the development including renders, floorplans, availability and views. Users can book appointments at the sales centre from the app and even get directions from their location to the centre. The real drawcard of our mobile apps platform however is communication with Push Notifications. Push Notifications allow the marketing team to communicate intimately with users. The app can be also setup to autonomously communicate with users using geo-targeting notifications. i.e. as the user passes the development “you have just passed Pinnacle and only 5 minutes from the CBD". How do you think interactive platforms have changed sales office interaction? Wall mounted touch screens have been around for a while and their use has been typically limited to trying to engage customers with a few moving images or 3D model. Times have certainly changed with these displays not really impressing anyone who has used a smartphone or tablet; most certainly with their limited functionality and single person interaction focus. 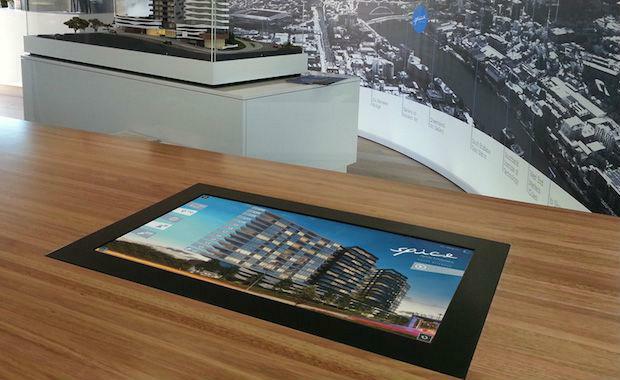 Touch screens in sales centres have involved into integral sales tools replacing antiquated ‘sales books’. Most people coming into a sales centre would have done their research prior to coming in using their mobile phone and PC. What is the process of creating this software? This is a where we really redefined the custom software process. Previous to our system the usual process was to find a software developer, spend weeks telling them what you want, handing over 10’s of 1000’s of dollars and waiting months in hope and anticipation that you will get something remotely like what you described. Then when a floor plan changes you have to contact them with weeks and more cash lost. We identified that this whole process and cost is not viable for the property project industry. Q1 Design is different, all we require are the digital assets used to create your PDF sales brochure and literally a few days in development time. Usually, within a week we can provide a complete demonstration of your software for you to touch and interact with. Our team of talented graphic designers, software developers and user experience experts make this possible. What’s more is the cost is akin to website development. Content can also be updated instantly using our easy drag-and-drop online storage. How will the software develop and change in the future? We continually develop our software solutions based on client input and requests. The feature to jump from a 3D building external into a floor plan was one such request from a client that we adopted. Tell us how your software was used in one of your projects? A recent install example is the Spice Development marketed by CBRE. The sales centre in Spice has 2 of our drop-in platforms installed in bench tops. The platforms integrate seamlessly into the sales centre and are very aesthetically pleasing. The sales team can bring up any marketing content directly on the screens and share this with clients. This includes the development video, lifestyle images, POI over live maps, PDF schedules and even the website. Any floor on the building can be selected and the floorplate navigated. Different apartments can be compared along with their respective layouts, finishes and even views. Once a particular unit is selected an email can be straight from the platform for the sales team. Where do you see the technology taking the industry in the next 5 years? The technology has already evolved into a fully functional sales tool from just another presentation gadget. The next evolution will be integrating this experience with a mobile sales strategy to assist in communication efforts with clients (38% of our daily media interactions occur on a smartphone - google multi-screen world research document). Further to this, the technologies will become more impressive with the eventual development of properly functional holograms. Focus has to be maintained however, on a usable tool instead of just gimmick. This article has been prepared in partnership with Q1 Design and TheUrbanDeveloper.com team.